Polarized 3D Crosstalk, how to diagnose this immersive interference. Originally broadcast 15th March 2017. As well as ensuring presentation quality is outstanding, it's vital that exhibitors are aware of one of the major recent issues regarding 3D movies, that of crosstalk or more commonly known as ghosting, how to diagnose the cause of it and what the impact will be to movie-goers. PREMIUM SEATING; IS IT ALWAYS JUST THE BACK THREE ROWS? Originally broadcast 9th September 2014. With exhibitors swapping traditional seats for recliners in a bid to improve customer experience, one of the key recurring consumer issues of presentation quality and brightness (particularly in 3D) is examined from a business perspective and how at little or no cost exhibitors could secure and grow box office revenue and increase overall occupancy rates. Potential new seating pricing models, how these might drive increased revenue, increase overall ticket sales and in turn, concession sales. 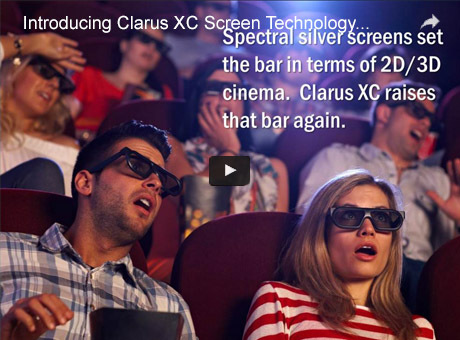 Designed to work with all passive 3D systems, Clarus XC screens create visibly deeper 3D content which is designed to draw in the audience creating a more captivating viewing experience. A whiter look under projection mean that colours look visibly richer and more accurate both in 2D and 3D resulting in a more defined, sharper and crisper pictures. How can it help you improve both 2D and 3D presentation? What does the industry think of it? How might it protect and even increase box office revenue? As well as on-screen brightness levels, uniformity of brightness across the screen is a key element for cinema exhibitors wishing to meet industry-standard compliance for their auditoria. For 2D presentation, DCI standards dictate that edge brightness should be between 70 - 90% of centre screen brightness to achieve compliance. This is typically more difficult to achieve with certain screen configurations however optimised changes in screen design can significantly improve brightness uniformity. In this FREE recorded web seminar from Harkness Screens - the thought-leaders in screen technology and presentation brightness will show you how cinema operators can significantly reduce auditoria operating costs, increase energy efficiency and meet corporate social responsibility targets. Why the costs of digital projection are significantly higher than 35mm film projection. The benefit of using gain screens. Practical examples of cost savings that can be achieved from using gain screens. Design, construction and technical considerations for auditorium design when using gain screens. In practice many 3D screens are operating with much less than 4.5fL and the choice of screen is a significant factor in this. However it is not just 3D where correct light levels are important – there are many cinemas operating in 2D with light levels below 14fL and a factor here is the higher operating costs of digital projection compared with 35 mm film projection. Screen selection is an important consideration in achieving the 14fL brightness standard in 2D presentation.